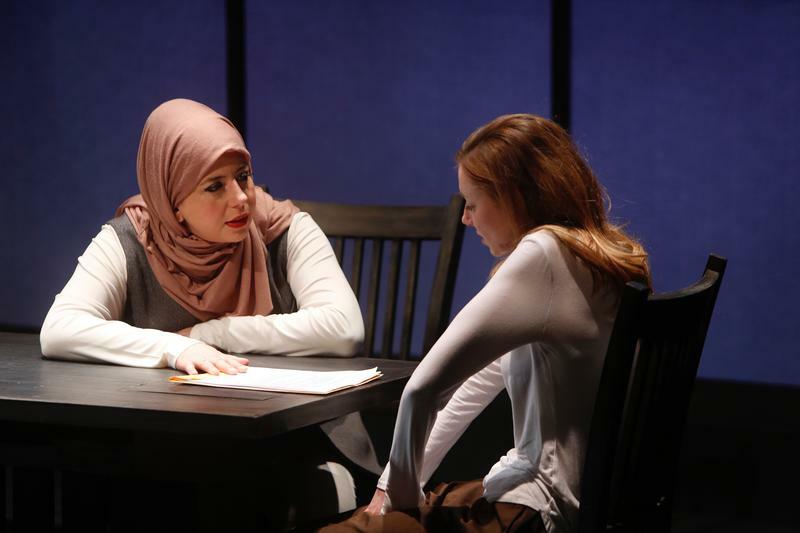 Susaan Jamshidi portrays Muslim attorney, Claire, and Lindsay Stock portrays radicalzied Muslim, Susie. Playwright Selina Fillinger wrote the original play “Faceless” while still a college student at Northwestern University in Chicago. Now, the play is showing through Feb. 4, at the Repertory Theatre of St. Louis. On Monday’s St. Louis on the Air, host Don Marsh talked about “Faceless,” which explores the story of an American woman, Susie, radicalized online and recruited by ISIS. She gets charged with conspiring to commit acts of terrorism – and her courtroom prosecutor is a Muslim woman. Fillinger joined the discussion along with the play’s director BJ Jones, artistic director at Northlight Theatre. Jones said Fillinger’s play was chosen since it increases people’s view of the world. “[‘Faceless’] had all the hallmarks of the things [Northlight] looks for in our choices for new works, in particular, the notion of increasing compassion and increasing our audience’s knowledge of a situation like this,” Jones said. Fillinger said she drew from real news stories about Americans trying to join ISIS to write the plot of “Faceless.” With more than 250 people in the U.S. trying to join the terrorist group, Fillinger wanted to look more deeply into the issue. “We all talk about them like, ‘they’re just crazy, they’re just freaks,’ but I think that’s an irresponsible way of talking about it – disregarding them as crazy people – because then we’re not really looking at ‘okay, but something is driving them to this,” Fillinger said. Fillinger developed the Muslim attorney’s character, Claire, to counter the radicalized Muslim’s “warped perspective” of the Quran. “It felt very important that if I were to be presenting this girl [Susie] who’s going to be saying all this stuff that many Muslims Americans would disagree with and say, ‘that is not my faith, that’s ISIS,’ that we had someone who had the healthy relationship with [Islam] represented” she said. Host Don Marsh talked about “Faceless,” a play that explores the story of an American woman radicalized online and recruited by ISIS. She gets charged with conspiring to commit acts of terrorism – and her courtroom prosecutor is a Muslim woman.